* when he utters the 9 magic words that sends me sweet dreams everynight……. Ryan is currently attending Julia Gabriel and Shichida now but over the span of 8 months of so, he hasn’t showed much improvement in terms of independency and social skills. He is very vocal but very shy at the same time and always need companion. I’m hoping by esposing him to nursery/playgroup environment would really help improve his social skills. Back to nursery. Ahh.. ahh.. *headache headache* again. Ryan will be turning 3 next year and it only make sense I start my nursery scouting if I want Ryan to join the classes in Jan09. I have shortlisted quite a number, made numerous enquiry calls, visited a handful; only to realised that most of the better ones (better ones = reasonably good and affordable) are all fully subscribed. After much research, I found out if I want to enrol Ryan into any of these good schools (good = again does not mean elite), I should have put him on a waitlist at least one year in advance and yet that doesn’t guarantee a place. I learned my lesson. The hard way. 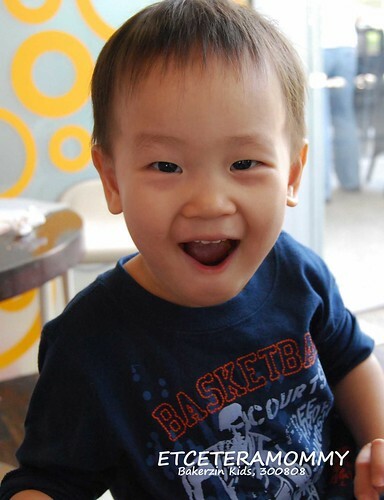 Back in Nov last year, I signed Ryan up with a full chinese medium nursery (highly recommended by my cuz). It’s one of the very few good Chinese nurseries in Singapore. I know the chances of getting in are slim, nonetheless I was bearing hope since I signed up more than a year in advance for 2009 intake. Sounds super a bit kiasu I know but afterall no registration fees required, just sign up la. I called them last week for an update. I was flabbergasted when they told me places for next year’s N1 intake are all taken (priorities given to waitlist who has siblings in the school / siblings who were ex students. Like us.. no connections sorry lor). We are now conveniently pushed down on waitlist for 2010 intake. Mad..!! Madness!! It’s only nursery god sake! Okay.. what to do. That’s how life gets around here. ** Meals: Breakfast and Lunch inclusive, some includes shower time. ** Curriculum Methodolgy: Some schools swear by themed based, some on literature, montessori, and some have their self school trademark methodology. I would say mostly follows themed based methodology here and ‘play and learn’ style of teaching is encouraged esp for that age group. Not so much on academic. ** Teacher-Student Ratio: Ranges from 1:6 to 1:12 (MOE guideline is 1:15 for nursery level). Some schools take in as many as 18 students in a class with one teacher and one assistant in a class. ** Development Report: Some monthly, half yearly with weekly email updates on the curriculum activities. Portfolio or children’s artwork, craft, etc would be given too. Parental involvement is highly encouraged here. ** Chinese: Mostly have chinese as part of the curriculum with English as main medium (60:40 ratio). Some schools practise bilingual environment, meaning 1 English and 1 Chinese teacher in a class. Not many schools can afford that. Most with just one teacher and an assistant at most at any one time. ** Subsidies: Lucky lucky if you are a Singaporean. Working/Non working moms are entitled to a max of $150 subsidy per month off the school fees. Not bad eh..
We have not decided which school to enrol Ryan with. I’m still evaluating, still contemplating, researching, what not…I do not want a school that emphasises too much on academic for this age group. I am a strong believer of ‘learn through play’; that a kid will only learn if they are truly happy and enjoy. Aahh.. aahh… so so… how? The fairly good ones I have enlisted earlier which we can comfortably afford have all been snapped up. Further, schools which offers flexi programme (2 – 3 days a week, the timing I am more keen at) are hard to come by. We are on waitlist for some, some we totally give up as the list are simply ridiculously long. Hopefully we get to hear some good news soon. What to do. Cannot afford the elite schools, and yet I couldn’t bring myself to sign up with kindies that can’t even keep their toilets clean. Yeaks!!!! Marriage registration was such a fuss during my time. We had to go to the registrar office at least a month in advance to register our details, submit our passport pictures and book a scheduled date. Our pictures and details will then be posted on the registrar office’s notice board for one month before and after our registration date. Anyone with objection to our impending marriage could then file a report. Now I guess with marriage records easily available online, that process can be avoided. All you need is just a click on the search button for name, initial, age, city or state. I was at United Square again couple days back. Unfortunately this time round the activities Ryan participated when we were there about a week ago were no longer available. Water Balling (aka Woof Ball) was not there either. I checked with the information counter and found out the organiser of Woof Balling. You can check this site www dot woofballs dot com dot sg. I emailed Bob and asked if Woof Ball would be made available in Malaysia. Unfortunately the answer is no. So, girls and guys, if you are interested to participate, you would have to come down to the lion city. We moved to Singapore last year due to work. I’m grateful I do not face much difficulty blending into the society here. One of my friends, Jeena one of the Latina Girls I met last time has just moved into the lion city too with her family too. I hope she is able to meet some new friends settles in fast as I heard she met some new found friends through a latina website.